Rather than wallowing in another summer gone by, on the first day of September we’re looking forward to fall’s biggest upside: music festivals. While common (read: “basic”) knowledge conceives of summer as festival season, the truth is that the best ones happen in September, October and November. This is partly due to the fact that the ICAS Network /SHAPE Platform fires up its arsenal of forward-thinking events, but there are also end-of-summer bashes like Outlook (which takes place this weekend) and major industry conferences such as the Amsterdam Dance Event—not to mention our own Electronic Beats-sponsored celebrations in Tirana and Budapest as well as our partner festival Up To Date in Poland. There’s so much to sort through that we’ve compiled another handy map to help you plan your summer, and you can find a few notes on a few highly recommended picks below. 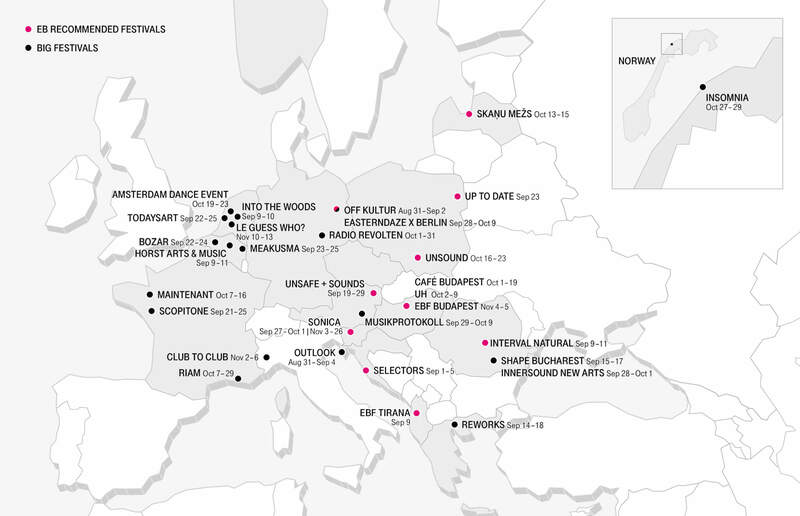 As with our summer festival map, magenta dots represent our favorite upcoming events. Interval Natural: After the tragic fire at Bucharest’s Colectiv nightclub foiled Interval’s plans to throw a 100-hour party last fall, the team returns with a new concept this month: a two-nighter in a fortress in the Transylvanian countryside. The lineup stars minimal legends like Mathew Johnson, Onur Özer, DJ Masda and Cab Drivers on a Funktion One sound system. By the way, today (September 1) is the last day to buy final release tickets. Skaņu Mežs: Active since 2003, this small festival in Riga, Latvia combines a showcase of artists affiliated with SHAPE as well as tasteful bookings from the wider world of avant-garde music. This year’s heavy-hitters include Autechre and King Midas Sound. UH Fest: Ultrahang is a great excuse to visit Budapest at least once a year. It was our favorite festival in 2015, and we’re excited to return this year for another impeccable program that combines cutting edge takes on contemporary classical music with a few killer club nights. The hook: UH never books the same act twice. Unsafe + Sounds: We only know a few of the artists booked for the third installment of this Vienna-based series, and those familiar names indicate that the rest of the program will be pretty out-there, in a good way. Unsound: This annual weeklong series in Krakow is the most famous experimental festival. It’s immaculately curated, innovative and somewhat more club-oriented than most of its counterparts in the ICAS Network and SHAPE-affiliated events. Each year the staff develops a theme to guide the program; last year it hosted many unannounced performances under the “Surprise” banner, and this year’s Dislocation idea will tie together appearances by Demdike Stare, Aïsha Devi, Amnesia Scanner, The Bunker NY and more. There’s also a bonus weekender from September 15-17 in Vladivostok, Russia with Rabih Beani, Buttechno, Laurel Halo, Lotic and local DJs.